Fire!, the band, is a trio: saxophonist Mats Gustafsson (The Thing), bassist Johan Berthling (Tape) and drummer Andreas Werliin (Wildbirds & Peacedrums). They have collaborated with others in the past, as on their second and third albums, recorded with Jim O’Rourke and Oren Ambarchi respectively, but those records only go so far in preparing the listener for this, their latest effort. Fire! 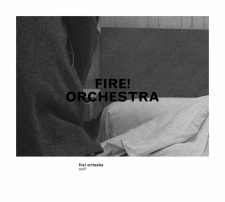 follow up the cold blast of that Ambarchi collaboration with this unprecedented blow-out for Rune Grammofon, convening a 28-piece Fire! Orchestra from the burgeoning Swedish jazz, improv and avant rock scene (among them the veteran guitarist Reine Fiske, who recorded a blistering session with elephant9 last year; see below for full credits) to tackle a live conduction of a new two-part composition, Exit!. Five female voices front the orchestra, with Mariam Wallentin (husband Andreas’ partner in Wildbirds & Peacedrums) and Sofia Jernberg (a classically-trained, Ethiopia-born singer/composer) most prominent among them. Their vocalising of incantatory lyrics penned by Arnold de Boer (The Ex) gives Exit! both its necessary narrative coherence and much vivid expressivity. Insinuating itself on a sleek bass/drums mantra behind an initial exposition of those lyrics, “Exit! Part One” slowly, inexorably swells then breaches its banks with a surge of brass, a floodplain of harsh-blown reeds and a squall of electric guitar. The orchestra reaches critical mass within fifteen minutes only to gradually dissipate. As Mariam Wallentin riffs on the lyric refrain, “Fire stay with me”, various instrumental voices – notably a tenor sax and Sten Sandell’s piano – come to the fore in loquacious, conversational exchanges. “Exit! Part One” ends with the orchestra, having once yielded completely to Wallentin, accreting once more to her imprecatory incantation. Their individual lines are a little more frenetic now, but subordinate, always, to that loping bass groove. Comparisons suggested in the press notes – Sun Ra’s “Space Is The Place”; Chris McGregor’s Brotherhood Of Breath – only tell half the story. In its first part, Exit! trades some of the dextrous élan of big band free jazz for an altogether more sombre mood, a portentous weight closer to Black Sabbath, or the second side of Black Flag’s My War. The longer, more discursive “Exit! Part Two” begins with Jernberg’s gorgeous soprano blending the lyric text with vocalese, accompanied by electroacoustic abstractions. When the orchestra kicks back in its pulse rate is higher, and it courses along with renewed urgency. Gustafsson takes up and overrides Jernberg’s incantations with passion, and the other horns join him in collective catharsis. Briefly evoking the power of a Peter Brötzmann-led big band, here the Exit! Orchestra’s gospelized licks are driven along by a surging, powerhouse ostinato. The power ebbs briefly once, as if there’s been a dropout in the power supply, but the sudden dying fall to silence at 11’15” is unexpected and dramatic. The lead female vocal is left exposed, Jernberg’s Sprechgesang licked by glottal murmurs and purrs of brass and clarinet. A nimble contrabass creates violent localised Simooms amid the orchestral frontline until, at 20’35”, a sudden hush anticipates a final violent outburst, the whole orchestra now in focused tumult. From here, precluding burnout or a collapse into a disfunctional cacophony, a controlled fade mirrors an orchestral diminuendo, with Christer Bothén’s guimbri adding some final splashes of colour and texture. Although I referred to this session earlier as a “blow out”, Exit! is no rag-tag free-for-all. This is a magnificent record, as boldly realised as it was conceived, punchy and economical for all the mass of its deployment. The composition of Exit! is credited to all three members of the core Fire! trio. Conducted by Mats Gustafsson, It was recorded in one day, in front of a Stockholm audience, in January 2012. Mariam Wallentin, Emil Svanängen, Nicolai Dunger and Sofia Jernberg: voice; Nadine Byrne: voice, organ; Niklas Barnö and Magnus Broo: trumpet; Thomas Hallonsten: trumpet, organ; Mats Äleklint: trombone; Per Åke Holmlander: tuba; Anna Högberg: alto sax; Mats Gustafsson and Elin Larsson: tenor sax; Jonas Kullhammar: bass saxophone; Fredrik Ljungkvist: baritone sax, clarinet; Christer Bothén: bass clarinet, guimbri; Andreas Söderström, Reine Fiske, Sören Runolf and David Stackenäs: guitar; Sten Sandell: synth, harmonium, piano; Joachim Nordwall: electronics; Johan Berthling: electric bass; Joel Grip, Joe Williamson and Dan Berglund: bass; Andreas Werliin, Thomas Mera Gartz, Johan Holmegard and Raymond Strid: drums. This entry was posted in Album and tagged Andreas Werliin, Fire!, Fire! Orchestra, Johan Berthling, Mariam Werliin, Mats Gustafsson, Rune Grammofon, Sofia Jernberg. Bookmark the permalink.